For a time, James was the head of the family’s British newspapers, a position he’s since resigned, along with his spot as chairman of the BSkyB board, among others. Although e-mail evidence has indicated that he approved an early phone-hacking settlement with hopes of concealing the widespread nature of the practice, James maintained that there was no cover-up and has attempted to minimize his role. He didn’t change course today. At the center of this morning’s testimony was also the Murdochs’ relationship with politicians. “I just don’t think there’s the very old-fashioned view of big media proprietors being able to dominate the landscape, I just think that’s not the case anymore,” Murdoch insisted, despite the family’s documented chumminess with Prime Minister David Cameron and culture minister Jeremy Hunt. (As News Corp. attempted to increase their ownership of BSkyB, a bid withdrawn in the wake of the scandal, Hunt was supposed to be overseeing the deal.). Murdoch said he prefers to think of his close relationships with politicians as “legitimate advocacy,” not an unfair advantage over competitors. 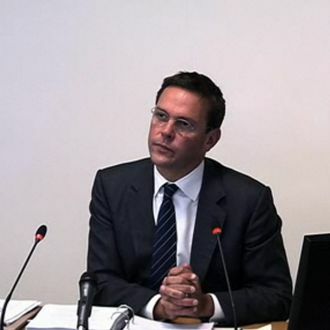 As a result, damning revelations have been few and far between in the multiple rounds of Murdoch testimony, but outside of parliament, arrests continue to pile up, as do the civil suits and number of “likely” phone-hacking victims. So while the committee report on media ethics is due at the start of next month — with Rupert’s forthcoming testimony as a grand finale of sorts — we’ve heard these same denials from James Murdoch before, and his gradual repositioning within his father’s company is already well under way. Ed Miliband, the Labour leader, demanded his resignation. “Jeremy Hunt should have been standing up for the interests of the British people,” he said. “In fact, it now turns out he was standing up for the interests of the Murdochs.